So if you’re like me and in the market for something EASY and TASTY to help ease a build up of veggies in your fridge, try making a miso soup! Miso is a traditional paste made with fermented soybeans and a grain like rice or other grains. It has a pleasant salty, sour, rich earthy flavor that is so good with broth! Maybe you’re like I was a few years ago and have never heard of it before, or maybe you’ve been lucky to try it at a sushi restaurant. 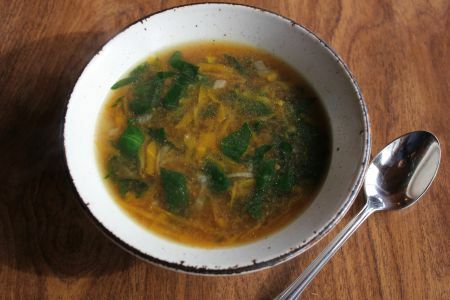 Miso is a great ingredient to have in your fridge to make a quick and easy miso soup. Miso soup is a Japanese soup made from broth (from seaweed and/or dried fish) and miso paste. In it’s most basic form it is simply a broth with miso added. It can be embellished with a whole list of ingredients including veggies, fish or tofu, and mushrooms. Where can I get miso? Believe it or not, it might surprise you that you can buy miso in a plastic tub or glass jar in the refrigerated section of your grocery store near the tofu. Or you can get it at a natural food store. It lasts a really long time in the refrigerater so buying a container should last you for a whole winter’s worth of soups! Because it stores exceptionally well, I just always have some in my fridge for the random unplanned times I decide to make miso soup! Health benefits and probiotics: Miso is a traditional fermented food that has been eaten for a long long time in Japan made with soybeans and grains. If you use an unpasturized miso then the beneficial probiotic bacteria are present and you will eat them with the soup, which can aid digestion and overall immune functioning. Taste: I just love the way miso soup tastes. Because you don’t sauté the veggies first as I do in many of my soups, miso soup is a light alternative to creamy soups that I often make. It’s clear-brothy, a little bit salty, and just delicious! Perfect for a light supper with a salad and bread. Function: It’s fast. It’s easy. And it’s flexible! You can put various different veggies into it and it will taste delicious! See my list below. Note about the broth: Traditionally in Japan miso soup is made with dashi, a broth made from seaweed and often dried fish called bonito flakes. To be official, you could buy dashi or make your own. Or do what I do which is substituting my homemade vegetable or chicken broth for dashi, which turns out delicious, too! 1. Heat broth to a boil. 2. Add optional ingredients and simmer until tender. Turn off heat. 5. Add miso back to soup and serve! In a pot, combine the broth, garlic, ginger, onion, carrots, and mushrooms. Bring to a boil and simmer until almost tender. Add the greens for another couple minutes until wilted down. Take a ½ cup or so of the broth out of the pot and into a small bowl. Combine with miso to completely dissolve. Then add back to the soup and stir. Serve immediately! Have you ever tried miso soup? What is your favorite combo of veggies in it? Hit reply and let me know!